Hibs’ Head Coach Alan Stubbs insists that there is no need to panic despite seeing his side lose their last two games, at home to Rangers then to Raith Rovers at Starks Park. Whilst Hibs remain in second place on goal difference, Rangers have a game in hand so tomorrow’s game with Queen of the South at Easter Road takes on an added significance given that on form champions Hearts are heading to Ibrox on Sunday. 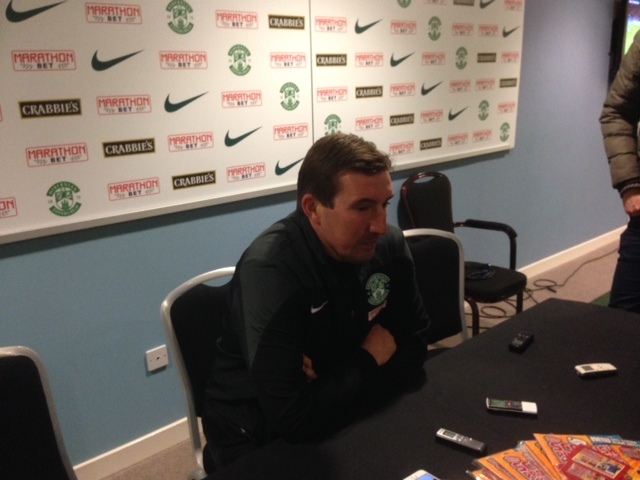 Stubbs told the Hibernian club programme: “When you look back at our last two results, naturally we’re disappointed with the outcomes – it underlines the fact that in this division the margins are so fine. As a group, we’ve learned some hard, sharp lessons, but we can’t let that frustration eat away at us – there’s no need to panic because I believe this group is equipped to reach our objective. “A big positive at Raith Rovers was the return of Farid El Alagui after his successful recovery from an Achilles injury.Throughout his long absence, his attitude was spot on and his recovery is a testament to his professionalism.Thanks to our excellent medical staff for helping Farid to come back from such a serious set-back – his return was a real team effort. “Since the first day of the season, our goal has been to achieve promotion and, even though we’ve now experienced a couple of recent set-backs, we must keep everything in perspective and stay committed to the cause.The club and the group is a close-knit environment and everyone pulls together. The players have all been fantastic for me and they all understand their roles within the squad. “They know what I want from them and I know they have the desire, ability and attitude to succeed.At this moment in time, we need to be strong mentally – there’s no time to start complaining about factors that are outside of our control.We control whether or not we win and everybody has to take responsibility, be brave, do the basics properly and make the right decisions on the pitch. “Defensively, we need to be solid and going forward we need to match fluency with urgency and show a greater degree of ruthlessness in the final third.When we create chances, we must take them. That’s the nature of the game – we have to kill teams off when we have the opportunity.I believe that if we stick to the gameplan then it will all click into place again and, as a unit, we will earn the results that the quality of our performances merit. “There is a growing sense of expectation as we enter the business end of the season. Of course, that is a pressure, but a good pressure that all good players thrive under. Undoubtedly this is a massive game, one we are very capable of winning. Queen of the South are a good team – their position in the table underlines how good they are.